A freelance photographer in the US has seen his search to find a mystery couple he snapped seemingly in the middle of a proposal go viral... but has still not located the pair. Matthew Dippel captured the moment on 6 October in Yosemite National Park in California while waiting to take a photograph of his friend Josh. He usually works in a bar in Grand Rapids, Michigan, but was visiting Yosemite on a road-trip from Seattle down to Los Angeles. The national park, with its dramatic cliff faces and stunning waterfalls, was a must-stop for the self-taught photographer. "It's been on my bucket list for a while," he told the BBC. "Yosemite is an incredible place to take photos, honestly it's a hard place to take a bad photo in. 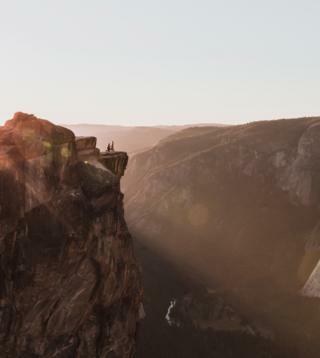 "I had seen a lot of really really beautiful pictures from Taft Point and wanted to see it for myself. We planned on going there at sunset and next thing, well you can see what happened after that." The 24-year-old was standing with other photographers and tourists, waiting for Josh to take his turn at the 3,500-ft drop ledge, when he took the shot that has now gone viral. "I had everything all ready to go on my camera so I just had to snap away," he said. "But the couple walked out before he did, so I just was in the right place at the right time. "I sort of checked my surroundings to make sure I wasn't encroaching on another photographer's work, but there was no-one next to me." After grabbing shots of Josh, Matthew says he raced around to the point to try to find the couple to show them it. But he arrived to find dozens of people, including three or four other couples dressed up, all ready to pose. He asked about 20 of them but none were the couple in his photograph. Matthew then tasked the internet with finding them a few days ago, after sorting through the photographs when he got back from his trip. It has been shared and liked hundreds of thousands of times since, garnering much more attention than Matthew expected. "I just genuinely wanted to find out who the people were to deliver this photo to them, because I think it's a super special moment that they could hold on to." The response to the photograph has not all been positive - some online have accused him of faking the image, with amateur sleuths pointing to the couple's unusual smart dress as evidence. "Everyone's been really supportive and they've come to my defence to people who are trying to question the validity of the photo. It's not staged at all. I don't know the couple, I'm just trying to figure out who they are," Matthew said. Although it has visually stunning views, the hike to the spot where the photographs were taken isn't particularly difficult to get to. The official national parks website says it is only a 2.2 mile (3.5km) "moderate" round-trip to Taft Point from the Glacier Park Road, where you can park. "This isn't the first proposal photo that's been done on that point. You can look up other photos from Taft Point and see the exact same thing - which is another reason I was surprised by how much traction the photograph has gained," he told the BBC. An Instagram search confirms how popular the spot is, with some women even donning bridal gowns for their own shoots there. Despite a few days passing with no luck, Matthew still believes the mystery couple may come across the photograph and his search. "I still have hope, because it continues to gain attention and hopefully it'll find them. I'm honestly surprised it hasn't already!"